We knew it was coming for a while now. Ever since Tesla introduced the P100D battery back for the Model S and X, but the automaker said at the time that it wanted to focus on making the performance version of the pack and that the non-performance would follow later. 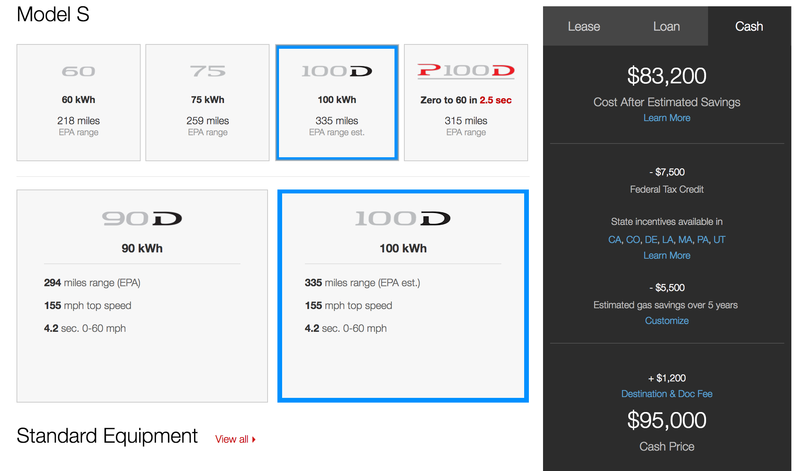 That is apparently today since Tesla quietly updated its online design studio early this morning and both the 100D version is available for both the Model S and X. While the P100D battery pack on the Model S made the Tesla’s flagship car both the ‘Quickest Production Car in the World‘ and the electric car with the longest range in the world, the P100D is losing the latter title to the new Model S 100D. The P100D has an EPA estimated range of 315 miles while the new 100D hits 335 miles. It also brings down the entry price of Tesla’s 100 kWh battery pack by an incredible amount since the Model S P100D starts at over $130,000. While it easy to assume that it’s likely going to be a very popular option now that it is Tesla’s longest-range option, it will be an interesting test for Tesla to see how electric vehicle buyers value range boosts like that for a price. And of course, the new 100D is also available on the Model X and it extends the range of the all-electric SUV to 295 miles – again for ~$30,000 less than the performance version. The new option is likely to boost Tesla’s sales going forward by not only increasing the range on a single charge of its longest range option, but also significantly reducing its price.